Thank you all for your well-wishes on the Coscto booksigning! After I got home, I confess I had one of those "Phew! That's over!" moments. Despite my concerns about nobody showing up, I had four blessed writing friends who made the trip specially to offer support, and sort of hung around like groupies (smile). And two blog readers came also -- oh my, what wonderful women they were! We had a delightful time getting to know each other. A third blog reader who lives further away sent her son to buy a book, a charming young man who was a pleasure to meet. I got to the store early to scope out the layout. And there I was! The table provided was just the right size -- not too big, not too small. But it was bare. Fortunately I had thought to bring a tablecloth, so that was all right. A funny thing happened: while I was sort of scoping around before setting up, I saw a woman pause by a stack of my books, glance at them, pick one up, and drop it in her cart. I WAS THRILLED!!! I wanted to trot after her and offer to sign it, but of course she would have thought I was a lunatic so I didn't. Thank you all for your well wishes, and thanks especially to the two readers (who shall remain nameless for OpSec purposes) for coming to see me. I was great to put names to faces! Thanks so much for the update and the picture of your "crew!" Wish we lived closer so we could have made it to the event -- and for LOTs of other reasons. If you were in Central Florida I would have made the drive and talked your poor ear off!! Congrats! Thank you, ladies, for being there on behalf of all who were too far away to make it to the gig. If I lived nearby I'd definitely have come over to meet you. That would be so cool! Wish I could have been there to meet you, Patrice, but I'm stuck here in KY. I've been reading your blog faithfully for about a year and I absolutely love its honesty and wisdom. You're living my dream and I hope that one day I'll have the courage and the means to have my own little homestead, too. Until then, I'll learn as much as I can from your blog and your new book! God Bless! 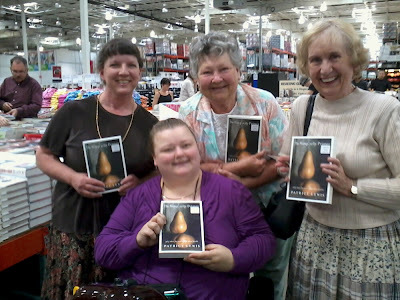 Will other Costco's be carrying your book? Not sure, Jessica. In order to do a booksigning there, the publisher had to go through an application process with the regional office in Seattle. This **could** mean all the regional Costco's will carry the book, but I am by no means certain. Next time I'm in Coeur d'Alene I'll have to zip into that Costco and see. If it's regional, it should mean the Kenmore, WA store may carry it. Cross your fingers. Now if you could get Costco to do a Tumbler Signing. Your book is on hold with Amazon, but I have two beautiful solid wood hand made tumblers. My husband and I went to our Costco on the West side of the state and I was SO bummed that your book was not there. :-( Hopefully it will make it's way to our side of the state soon! If not, I'll have to order one. :) Can't wait to read it.